A week of U.S. war moves against Venezuela | Fight Back! Chicago, IL - One week ago, on January 23, a new stage in the Bolivarian Revolution began. The U.S. government and its lackey regimes in Latin America, the so-called "Lima Group," broke international law and ignored the Venezuelan Constitution by declaring Juan Guaidó - leader of the far-right People's Will Party - the legitimate president of Venezuela, and pompously demanding Nicolás Maduro's resignation. Defiant as always, millions of people across Venezuela came out in support of their revolution, condemning Guaidó as a usurper and an imperialist pawn. In an address to thousands of revolutionaries outside of the presidential palace, Maduro swore that the revolution would be defended. He further announced that all diplomatic and political relations are to be severed with the United States, and called on the U.S. embassy to evacuate within 72 hours. In the days since, all sides have been on the move. At the moment, Bolivarian Venezuela has won the battle for international opinion. Motions in support of the coup were defeated both in the Organization of American States (OAS) and the UN Security Council. China, Russia and Turkey have refused to drop their support for Maduro, leaving Venezuela with some of its most critical trade and credit partners. Meanwhile, the countries of the Bolivarian Alliance for the Peoples of Our America (ALBA) stand firmly behind the legitimate government, ensuring that it is not left without friends in Latin America. Yet U.S. imperialism is relentless, and its actions prove that it seeks to punish the Venezuelan people for their collective desire to be free. Under pressure from Trump, the May government has refused to release $1.2 billion in Venezuelan gold reserves in the UK. The following day, U.S. national security advisor John Bolton announced that it was placing sanctions of PDVSA, the Venezuelan state-owned oil company, blocking nearly $7 billion in assets that Venezuela has with its U.S. subsidiary CITGO and cutting the country off from an estimated $12 billion in profits this year. Both the Trump and May governments have said that they are willing to redirect these funds to the usurper Juan Guaidó. Clearly, sovereignty matters little in the West if it leads to a desire for independence from imperialism. 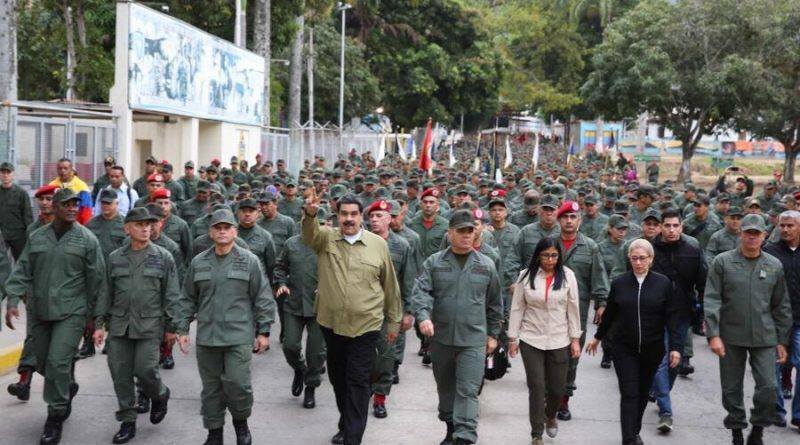 Meanwhile, the entirety of the Venezuelan military is in mobilization, and the over 200,000 members of the popular militias exercise drills across the country. Russian-made tanks are being moved to the Colombian border, where fears of an invasion are great. Speaking to an assembly of soldiers, Maduro proclaimed that the government and the United Socialist Party (PSUV) will form People's Defense Units "in every neighborhood, city and village" of the country. This happens alongside daily mass marches of the Bolivarian movement across the country, easily outnumbering the opposition marches confined to isolated opposition strongholds and wealthy Caracas neighborhoods. It is hard not to believe the words of Venezuelan revolutionaries when they swear that the U.S. will face another Vietnam War if troops set foot on Venezuelan soil. Very little has been heard from U.S. puppet Guaidó since his illegal self-inauguration. For his multiple crimes against his own country, he is being pursued by authorities. Attorney General Tarek William Saab went to the Supreme Court to demand a travel ban on Guaidó, who he said was "leading an attack against the Venezuelan homeland" and must be brought to justice. On January 29, Maduro addressed the world and stated that his administration is ready to meet with the opposition and find a peaceful solution to the crisis. The U.S. media referred to this as "conciliatory" and surprising. Yet over the years, the Maduro government has always responded to the anti-democratic actions of the opposition with calls for dialogue. In fact, nearly a year ago to the day the government and opposition were arriving at a peace deal after months of negotiations, a deal which included a new round of elections and a range of economic and political reforms. On the day that the deal was to be signed, the opposition leaders, who had put countless hours into these negotiations, did not show up. It later came out that the opposition's lead negotiator had "received a call from Bogotá" ordering them not to agree to peace. Any objective observer who follows the moves made by the U.S. government and its lackeys, and the responding moves made by the Maduro government, will immediately recognize who is the aggressor, who is working against a popular democracy. Donald Trump and his administration is in the midst of trying to tear apart Venezuelan society, to whip an upright nation back into line in order to guarantee monopoly profits and return their lackeys to their old position of dominance. It is absolutely critical that we in the United States build a movement of resistance to our government's actions. We must do everything necessary to prevent war against Venezuela, and to give the Venezuelan people the room that they need to build a better future for themselves.